Soviet two-seater Yak-52 is a tough plane, which not every pilot can ride on. Snorri Bjarnvin Jonson is one from few who can. After more than 10 years’ experience of flying this Yak-52, Snorri started to perform with it at air show across Iceland. He told to Flugblogger about very special feelings during it. Red-white Yak-52 with reg. TF-BCX is parked in a yellow hangar in Reykjavik airport, which rented by flugklúbbur alþýðu Yakar (people’s aeroclub of Yaks). The plane was produced in Romania in 1982, which means it’s comparatively fresh piece of this model. This airplane was called in Soviet Union as “school desk”, because was the first airplane for several generations of soviet pilots. It has been produced from 1977 to 1998, with total amount of around 1800. Even nowadays, it is the most common aircraft at post-soviet general aviation airfields. According to open sources, there are 339 pieces of Yak-52 in Russia now, but only around 100 of them airworthy. There are several modifications of it, including Yak-52B as light bomber for air-to-ground strikes, and even most up-to-date version Yak-52M with new engine M-14X, a three-blade propeller MTV-8 and catapult SKS-84MYA, which maiden flight was in 2004. Here in Iceland is the classical version of Yak-52, which was being produced until 1995 and mostly known as plane for aerobatic flights. According to soviet manual, Yak-52 has 360 horsepower engine M-14P with V530TA-D35 propeller, and can fly at altitude 1000 meters (~3300 feet) with maximum speed 270 km/h (~145 kn). Stall speed of the aircraft with idle throttle in horizontal flight is 110 km/h (~59 kn), inverted flight – 140 km/h (~75 kn). Maximum range is 465 km (~250 nm) and time 2,5 hours. The maximum flight altitude is 4 000 meters (~13 000 feet). Maximum G-overload from -5 to +7. In Iceland first owner owner of Yak-52 was the veteran pilot Björn Thoroddsen, who imported it in 1999. “I believe this plane was for him”, – said Snorri B. Jonson to Flugblogger, – “There were times, when these soviet airplanes were really cheap. First couple of years after the fall of Soviet Union you could buy a Yak-52 only for $5 000. Even now they are not so expensive, maybe $50 000 – 60 000. In Iceland it was made airworthy in 2002, and then aeroclub was formed from this one Yak”. In 2005 there were eight members of the Yaks club in Iceland. In 2006 they imported another soviet plane: four-seater Yak-18T. Then club grew up to 16 members. In 2017 there are 25 people in Icelandic Yaks club already. As Snorri said, all of them are interested in flying these russian Yaks. Should be said, Yak-52 is not the best plane in terms of maintenance sometimes. For example, the oil is leaking from the plane all the time while we were in hangar. There is even special pot for collecting it, which is put near the planes exhaust pipe giving infinite stream of oil. Pilots say that the oil stopped to leak from Yak, means there is no more oil in it. 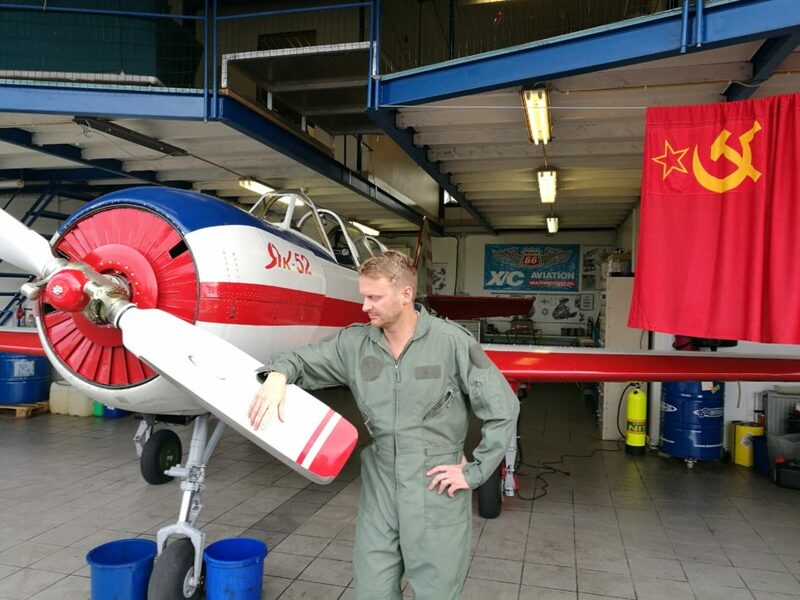 For aeroclub it’s not easy to do maintenance by own hands, that’s why they call a special mechanic from Lithuania to Iceland every time, when Yak-52 needs to be repaired. Nevertheless, it is love despite of difficulties. “I love to fly in this Yak-52. The plane is tough. Several years ago, many people were afraid of this airplane, because there was an accident 20 years ago in Reykjavik. The airplane span and hit the water. So, when we started we remember how cautions we should be flying this airplane. For training we called a russian aerobatic instructor Gennady Elfimov, who lives in UK. He came here for a few days and gave us a training. I flew a lot with him. We did all kind of stalls and went through the whole flight envelope. Moreover, we did some aerobatics as well, spins, hammerheads. We went through all things, which can go wrong. After this I could say, that it’s not a dangerous airplane. Nevertheless, if you don’t follow procedures it could bite. During the training we became confident, at least me. After 12 year flying it I can say: it’s a safe airplane”, – Snorri told. After the basics passed by, Snorri started aerobatic training by himself. At the beginning on a high altitude of 4 000 – 5 000 feet, where mistakes are allowed. With more confident he started to fly lower, so now people from the ground could see his performing in details. “Before performing day I draw out the man maneuvers in a special program, and then practice it. Of course, I also have it all in my head. Every time I do the program a bit different, than people have seen before. For me it’s important that the show should be impressive and looks good. I also should consider weather and landscape. For example, I did a display this year in Vestmannaeyjar over the harbor. So, I have to consider the mountain near it, check what I can do, what not to do, because the area is not so big and wide there”, – Snorri said. Except Vestmannaeyjar Snorri recently performed in Neskaupstadur in east Iceland, where was an opening of a new runway. Also Reykjavik, Reyðarfjörður, Hella and Eskifjörður. He wants more. “I would be happy to fly in Ísafjörður, if someone ask me to perform. Hopefully, I will do more of it in future, because I love it. It’s almost like a singer singing the song: you go on a stage and showing off what the airplane and you can do. It’s a great feeling, also ultimate rush. During manevuers I have 5,5G. I had passengers, who had blackout for a few seconds. But it is possible to overcome it by trainings, so the body will adjust to it. Also important not being too relaxed, so I strain my muscles a little bit during the flight. In general, it is the very special feeling flying this Yak-52. During the flight, you can feel tingling sensation in your balls because of this sound and vibration”, – Snorri said. Liked it? Take a second to support Flugblogger on Patreon!